Jump Menu: Do wasps swarm? Why do I get a wasp nest every year? What time of year do wasps build their nests? 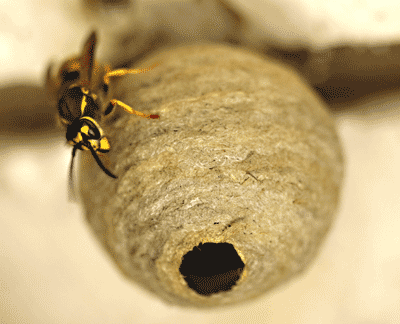 Are wasp nests dangerous? Do the local council provide wasp nest treatments? Wasps and Hornets do not swarm. If you have a swarm of insects in your garden or on your roof (more specifically: in your chimney), then this is a honey bee swarm. Wasps rarely nest in chimneys. Wasps do swarm feed and will report the location of a food source to their nest, recruiting help to overcome competition from other wasps for the food. Only honey bees swarm. 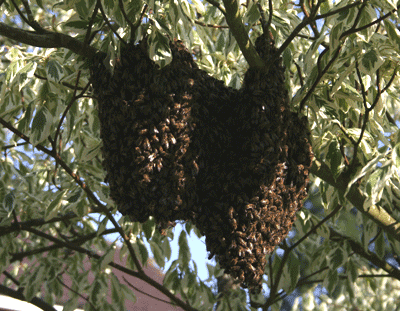 Honey bees swarm when the nest/hive has grown too large for their home. Approx half the colony leaves the hive with the queen, and they head off in search of a new home. New queens will hatch in the original nest. Usually, they land somewhere temporarily and send out scout bees to find somewhere suitable to start a new nest. When bees are clustered together, this is temporary, and they typically move on within hours once a new nest site has been found. If you have a honey bee swarm and want someone to collect it, take a look at our sister site List of Honey Bee Swarm Collectors UK or call your local beekeeping association which have swarm collectors who will come out and remove them and rehome them. Why do I get a wasp nest every year? If you are unlucky enough to have a wasp nest year after year it is not because you are a target for annoyance! It just means that your location is the right spot for wasps; your loft space is nice and dry and accessible. In general, it is older houses that tend to get nests each year; this is because the roof spaces have more access points than a newer type roof. Geographical location plays an essential part in wasp populations. What time of year do wasps build their nests? In general queen wasps emerge from hibernation mid-March and start nest building around mid-April, this is dependent on weather conditions. Once the first worker wasps have hatched, they take over nest building duties; the nest will continue to grow in size over the summer until late autumn when the nest produces new queens. It pays to wait until the beginning of June before searching for active wasp nests. By this time, there should be enough worker wasps hatched out to notice activity at the nest entrance. The ferocity of each wasp colony depends on the individual nest, in particular, the queen. It is the queen wasp that determines if the nest is aggressive or placid. You can never tell, so we always err on the side of caution and make an educated guess that every nest is aggressive! The danger of wasps comes from the venom that they produce in their stings. Some people are allergic to this venom and if stung can go into Anaphylactic shock. If not treated, this can be life-threatening. If someone is who is not ordinarily allergic is stung enough times, this can bring on shock, but this would only be due to multiple stings under a sustained attack. Best advice, if you are worried about being stung, stay away from wasp nests. Do the local council provide wasp nest treatments? 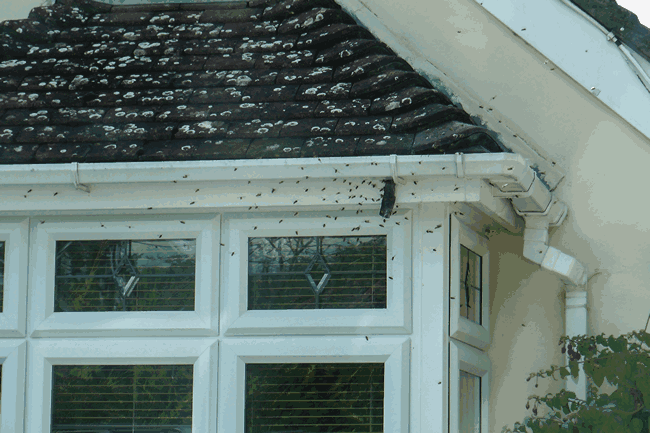 Depending on where you live, most councils do provide treatments for wasp nests. 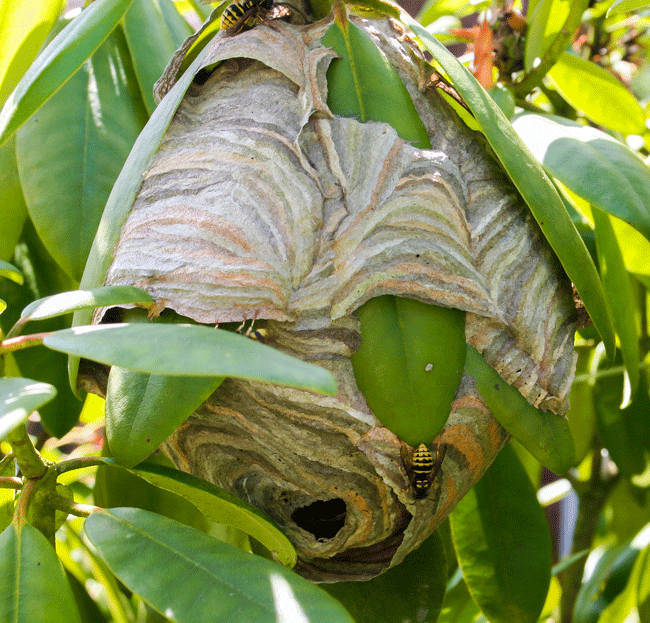 However, most authorities do not prioritise wasp nests, and the waiting list can be up to 4 weeks long. Hampshire wasp control provides a same day wasp nest treatment, and as a bonus, we are cheaper than our local authorities.